This section of Second Avenue is one of the streets to be rebuilt. Sections of six downtown Albany streets will be torn up and rebuilt this summer, and businesses are worried. But the contractor will be required to avoid or minimize any disruptions of traffic or special events. The Novak family, running the popular Hungarian restaurant under the family name on Second Avenue, expressed concern in an email. “We are a business that relies heavily on foot traffic and access to parking, and if those things are severely limited we will be in trouble,” they wrote. 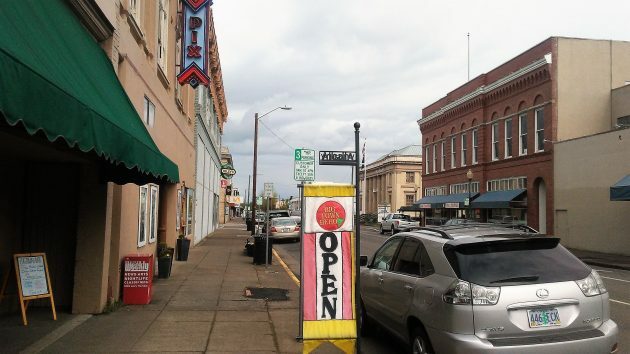 The city opened bids for the downtown “streetscape” project funded by the CARA urban renewal program on May 2. Emery & Sons of Salem, the company that rebuilt North Albany Road in 2015, was the lowest of three bidders at $7,988,501. The other bidders were Wildish at about $8.7 million and Pacific Excavation at about $9.8 million. The city council is expected to award the contract to Emery on May 10. A public open house to go over the project will be held from 4 to 7 p.m. May 18 at City Hall. The street work will start in June and must be finished by Dec. 1, according to the city’s specifications. 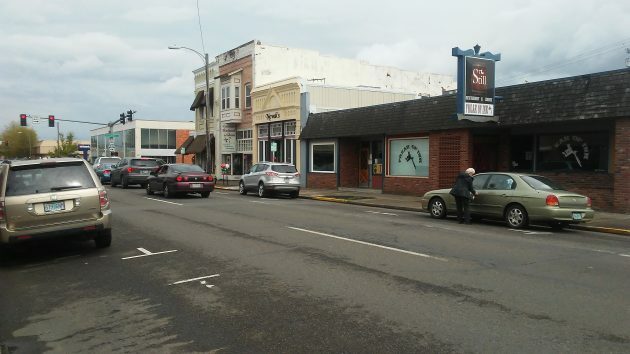 The streets to be rebuilt — variously including pavement, sidewalks, utilities, lighting, landscaping and so forth — are Second Avenue from Washington to Lyon, Third from Ferry to Lyon, Broadalbin from Water to First and from Second to Third, and Lyon and Ellsworth from First to Ninth. A water line will be replaced on Calapooia between Fifth and Sixth. The contract calls for 217 street trees to be planted (mainly Corinthian linden, columnar zelcova and pink flair cherry). Among the conditions set down by the city is that demolition and utility work — such as installing underground pipes — must be done between 7 at night and 6 the next morning Sundays through Thursdays. Construction will be done between 7 a.m. and 6 p.m. Mondays through Saturdays. The city compiled a list of summertime dates — farmer’s markets, concerts, sidewalk sales, the Aug. 21 solar eclipse, and so forth — and specified that no work be done in areas where events are taking place. There are other conditions to insure that traffic can always get through and businesses can be reached. On Second and Third Avenues, only one block is to be constructed at a time, and work on the next block can’t start until the previous one is done. The contractor has 14 days to complete each block. But for each day less than that, the contractor earns a $5,000 bonus. For each day longer than 14 days, there’s a $2,500 penalty. The story has been edited to fix a mistake in the date of the open house. It’s May 18, not the 28th. The city says businesses such as these on Second must be able to be reached during construction. I hope CARA gets the $8M sensory experience they so desperately seek from the folks who are paying for this project – the property taxpayers and the overlapping taxing districts that CARA skims money from. By the way, did CARA calculate the expected tax increment that will be generated by prettifying these downtown streets? I know, I know…rate of return on a CARA project is a tiresome and silly issue…. But most of us in our personal lives, I suspect even you, care deeply about return when our own money is being ‘invested. The sad fact is – CARA money is your money, and you don’t seem to care whether their ‘investments’ produce a quantifiable tax increment. That is irresponsible. The grinding wheel never moves on it seems. Thanks for the information and update! Do you know whether work is also planned on Crocker this summer? Yes, the city has called for bids that are due May 9. The project is a full reconstruction of Crocker Lane between Valley View Drive and Meadow Wood Drive. Seven million bucks from CARA, eh? How much of that is being skimmed from bond issues that were supposed to be for other things? In 2014, I asked the city manager that question after the Albany Revitalization Agency (the city council) passed a resolution that said CARA will not benefit economically from future bond measures. So, if the resolution is still in effect, CARA cannot skim from bond proceeds like they did in the past. Of course, since then the city has hired a new city manager and city attorney. You may want to ask them to communicate the current policy. What about all the other so….. many roads that do not get any repairs in this city?? And then all the pot holes, which are seriously dangerous? Maybe we could not plant 218 trees and fix the roads that have mot neen fixed in years.